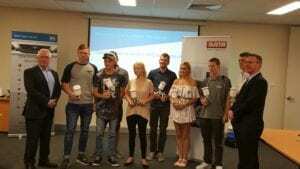 PPG Industries launched their NSW Scholarship Program on Monday 6th February, 2017 at their Eastern Creek HQ and Training Centre. Eight second year TAFE students were presented with their scholarship pack and welcomed into the program by PPG Business Manager, NSW/ACT Ken Wiggens who then handed over to Training Manager Trevor Duke who outlined the program to the students, TAFE representatives, shop owners and family members of the students. The Scholarship pack includes: Personalised SATA 5000 RP Digital Spray gun, SATA Airfed Hood and a PPG Jacket, bag and spray overalls. The Scholarship will continue for the formal period of the students TAFE training (2 years) even if they change Employer. TAFE representative Jeff Adams thanked PPG for the initiative and industry icon Richard Nathan spoke to everyone about his experiences in the industry and letting them know that this is still a great industry to be involved with and this was followed by a tour of the training centre and a lunch. EDITOR: What a great program for young people to receive. The students came from Wagga, Campbelltown, ACT, Mudgee, Port Macquarie, Mulgrave, Belmore and Albion Park and were selected by their TAFE teachers around NSW with the criteria for selection put together by PPG.